I worked out that airport marketing people must have great fun 'creating' names for their eateries, but wordsmiths they most certainly are not. So after deciding to put an 'embargo' on ANY establishments that were a play on words and any place that wanted to charge $9 for a sandwich, the young one and I resorted to fried galumph with deep fried humph! Why wasn't there a 'Waiting for a Plane' bar? Or, 'Better late than Never' cafe? 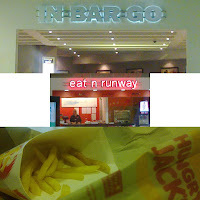 Or 'Why did I decide to fly the cheapest, nastiest airline' bar n grill? As the sky darkened and stars came out, the city lights began to flicker in the balmy Brisbane evening. Body feeling oh so weary, but with hours to go and a long drive home when we finally get there I decided to go in search of caffeine. A beacon in the otherwise drab landscape appeared right at the end of the terminal and possibly THE loveliest people behind the counter made me a great coffee! There is salvation right here - good people, good coffee and the promise that soon I might be home. [Well I was far, far from home but that coffee and the feeling that there are lovely people in the most unlikely places got me through - and I finally arrived home at 2am].